I read your book and applied the knowledge gained and your tactics in approaching the application process. I initially got an internship position from a company that rejected my application for a job position, and now found a job at a global company. Thanks for your knowledge and insights. Hi all. I’m leaving these messages amd sharing my experience of last week before the call starts for 2 reasons, 1. It will be long, 2. I am going partying to celebrate getting a new job. My experience is almost exactly how Chris told us it would be. His tip on talking directly to the hiring manager and not the HR works! It happened for me so it can happen for everyone. Hey, Chris. Great news, I’ve got that job offer! Dear Chris, I would like to thank you for your support and help in the job hunt! )… I now working in Hannover in the field of airports’ planning… I was lucky not to deal with the HRs, when I applied I was directly contacted with the “Vorstand” (professionals) and after the interview they offered me the Contract in 15 minutes! ))… I think that your business is extremely important for immigrants and I wish you to develop it as much as possible. Thank you and have a nice Sunday. Fadi Got A Job. 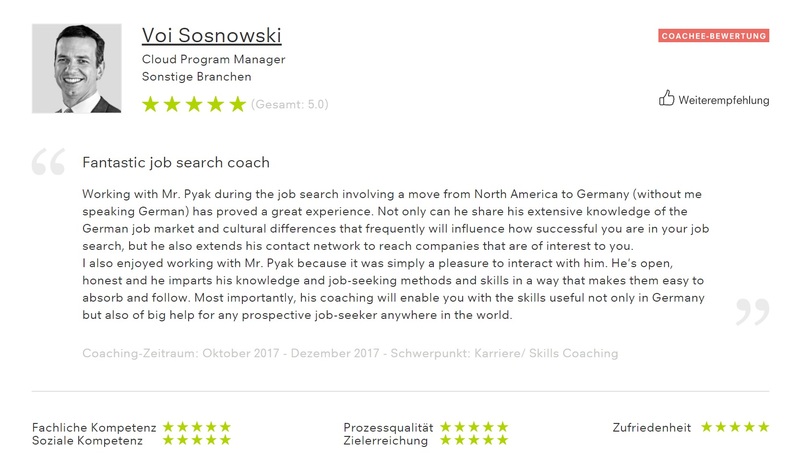 Expats searching for a job in Germany get best practices from Chris Pyak’s (former) coachee. Dear Chris, I am writing this message with immense pleasure, I have received an offer yesterday from a reputed company. It’s a fulltime permanent employment. I thank you very much for your support and the time we spent together in career coaching. Hello Chris, Hope you do still remember me 🙂 Just want to let you know that I got a job offer! You are right, we (foreigners) just don’t know the correct way to approach German employers, but we are not inferior to any German applicants! Thank you, Chris, for your useful tips! I actually attended one of your webinars back in 2016 when I was starting the job hunt, I took many notes and thankfully found a job here at InterNations. Ich freue mich dir zu sagen, dass ich eine Stelle in Deutschland gefunden habe. Ich fange am 1.11. als Projektleiter… in Frankfurt an 🙂 Deine Hilfe und Tipps funktionieren und haben mit sehr dabei geholfen. Hello Chris, I would like you to thank you for your help. The jobs posted on your page as your advices, proved very handy. I have a job offer and I am moving to Germany. I forgot to tell you that I was offered a contract in München 3 weeks ago. It was a big accomplishment achieved to a large extend due to your help. Hi Chris, I wanted to let you know that I’m enjoying my new job at the GIZ Interesting projects and a friendly international team! Thank you again for your invaluable coaching and support! Would you benefit from my advice in your jobhunt? Would you like me to introduce you to managers in my network – that you consider useful contacts? Book your individual career coaching now. Click here.